This was my first visit to Hukkeri (also spelled Hukeri), was here to visit Pushpa's relatives at a near by village Yellimannoli. While passing through Hukeri I noticed three large domes rising above the two/three storey buildings. 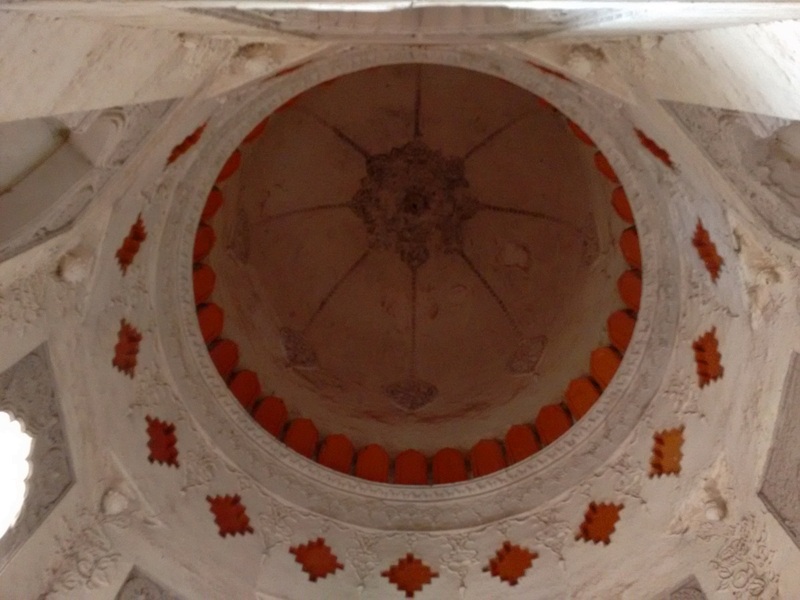 The domes were unmistakably Gummats, tombs of Muslim rulers. On our return journey we stopped at the tombs. There are 3 structures in one row, all of them built on platforms, similar in design but slightly different in sizes. The structures are cubical, have minarets at each of the corners and topped by a central dome.These Gummats are similar to those seen at Bijapur, Gulbarga and Bidar. 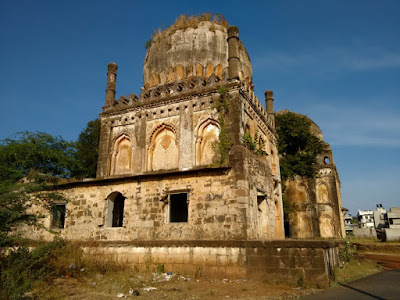 I searched online for info on these tombs and found a small write-up on Government First Grade College Hukkeri website. Following info is sourced from that write-up. The name Hukkeri is said to have been derived from the name Huvinakeri ~ street of flowers. When Hukkeri was part of Adil Shahi kingdom, roses grown here were exported to the kingdom's capital Bijapur. Hukkeri was controlled by Fate Bahadur before it came under Yusuf Adil Shah rule in 1502. Ain-ul-mulk Gilani was in charge of Hukkeri's administration, which lasted 40 years. 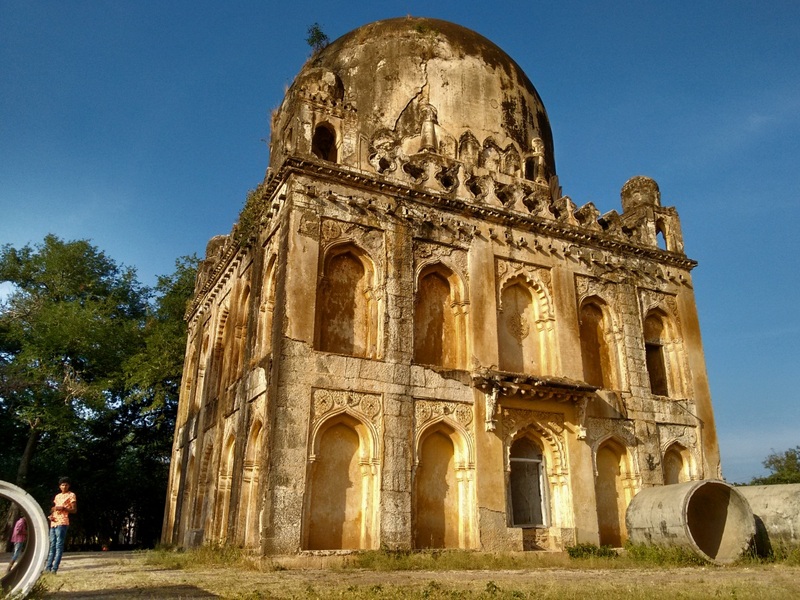 During Ain-ul-Mulk Gilani's rule a fort and two tombs were built. Ain-ul-mulk was succeeded by his brother Fateh-Mulk (1547 to 1568) during whose rule the third tomb was built. Fate Mulk was succeeded by two Bijapur officers Ranadula Khan and Rustam Zaman. 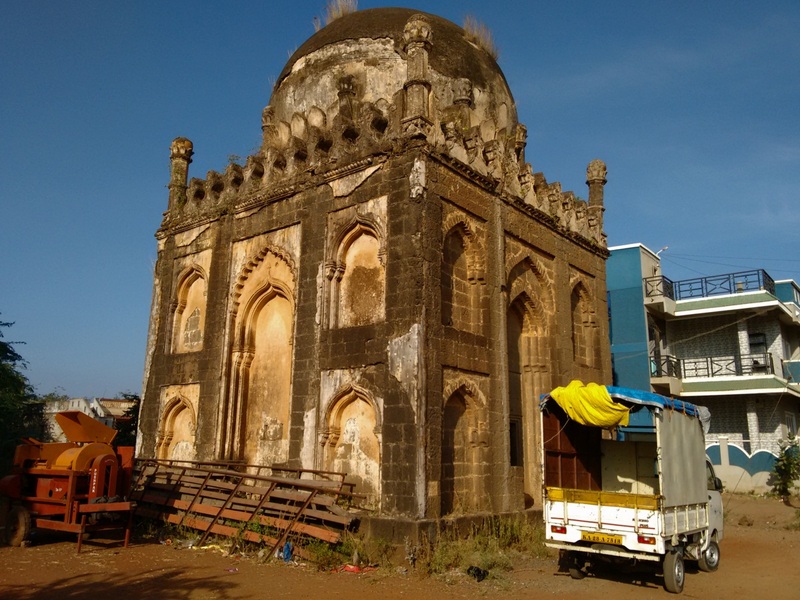 Rustam built the Chini Gumat and Kadam Rasul mosque (near bus stand) in 1680. Lets start with the tomb on the west. This is the second largest structure, it's floor measures approximately 35' x 35' and overall height could be 50'. 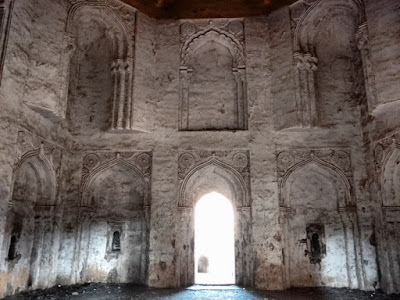 This tombs has two entrances and each of the four faces has arched niches. As seen from the east. This is the most neat and tidy of the 3 tombs, The platform top is tiled, so is the interior. 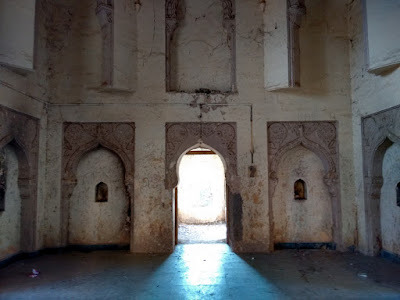 Here's a view of the interior, tiled floor, whitewashed walls but covered with cobwebs. The niches are decorated with simple but beautiful floral murals. One thing is missing.. there's no tomb in here. The white-red dome is clean and beautiful. The central hub reminds me of a cathedral at Bangalore. Probably there was a plan to hang a chandelier. This is the middle Gumbaz, the largest of the three. The structure approximately measures 42' x 42' x 55'. Each of the four faces has nine niches and an entrance i.e. four entrances at floor level. Some government contractor decided to use the monument's platform to store cement pipes. What an eye sore! This building seemed to have a wooden balcony above its front door. 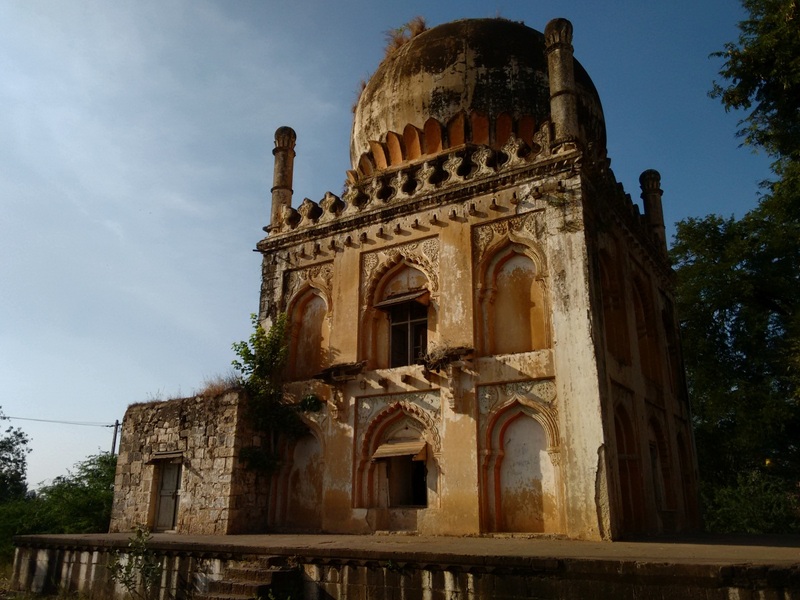 Trying to imagine its looks when it was newly built.. a dazzling structure with glossy white walls and a pearl smooth dome. A cheaper alternate for a marble coated building? The interior had been white-washed few years ago. The floor had no tiles.. no idea if the flooring was removed or it was never done The interior is unique too,. I love the corner niches. Even this structure has no tombs in it.. just a plain floor. The square floor plan transitions into an octagonal ceiling which in turn becomes a circle. The dome is golden.. I think that's the original color. I love the stud like protrusions at the octagon corners. Whoever created these structures had a great taste in architecture. Now coming to the third structure, the smallest of the three is a cute little building. Instead of equal sized niches it has one large niche in the middle flanked by smaller niches. I did not bother to venture inside this building. 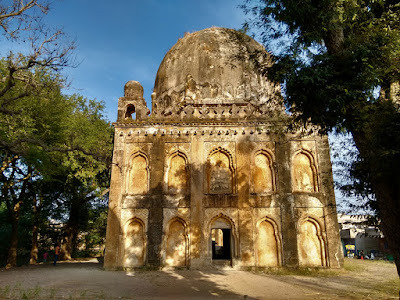 Well, Hukkeri was indeed important during Adil Shahi times. Quoting some content from the Government College website: The Muslim monuments of Hukeri are interesting to note. It has mosques like the Jamia [oldest], Janana, Kali, Kadam Rasul, Bagawan, Momeen, Taleban [new Gajabarwadi], Mokhasi and the Ganjul Bahar. The Jamia Masjid has fine wooden engraved Mihrab. 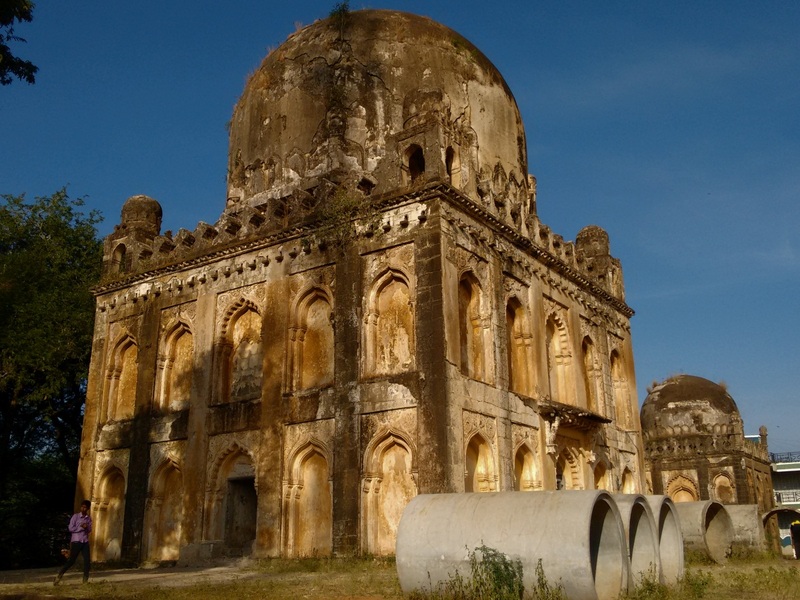 The Kadam Rasul mosque was built in 1680, has minars and a big hemispherical dome in the centre. It has a stone on which the Prophet [Rasul] is believed to have stepped, and is built by Rustum Zaman. The Kali-Masjid in Saudagar Mohalla has a Persian inscription above the entrance which states that Mansur Khan, an officer under Ain-ul-Mulk demolished a temple and laid the foundation of this mosque in 1582 AD and completed it in 1585. Hukeri has dargahs ascribed to a lady Mansahib [with inscription of 1568], Hamidud-Din [near Gajaberwadi Ganjul Bahar mosque], Alam Bukhari [in the precincts of Jamaia Masjid], Karim Bhasha [daughter of Feroze Shah Bahamani]. The urus here is held at the Mansahib dargah in the month of Rabi-ul-Avval when about 1000 people assemble. 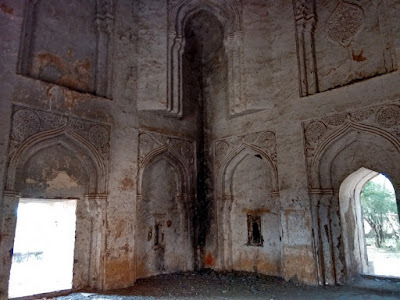 The dargah of Shah Hamidud-Din has an Arabic Inscription to the south wall which contains throne verse and is in characters of about 15th century. The Kadam Rasul has an Arabic on its sarcophagus which reads Ya Allah in very late charcters. The Alam Bukhari Dargah near Jami Masjid also has an Arabic inscription which contains throne verse and is in characters of about the 15th century. A loose slab in the Munsiff's Court of Ali Adil Shah I is dated 1561 in Persian is badly damaged, but tries to record the completion of some lofty structure. Another loose slab on the brink of a ruined step-well in Persian records the text of Mahdar [decision by assembly] made by the mahajanas and balotiyan [Balutedars] of Hukeri to the effect that one chawar land of Jaisetti situated in the vicinity of Karanja[fountain providing drinking water to town] and the guest house [Mehman khana] constructed for public use by Mansur Khan. A Marathi version of record is also seen. The place has five more such fountains with tanks built around them. 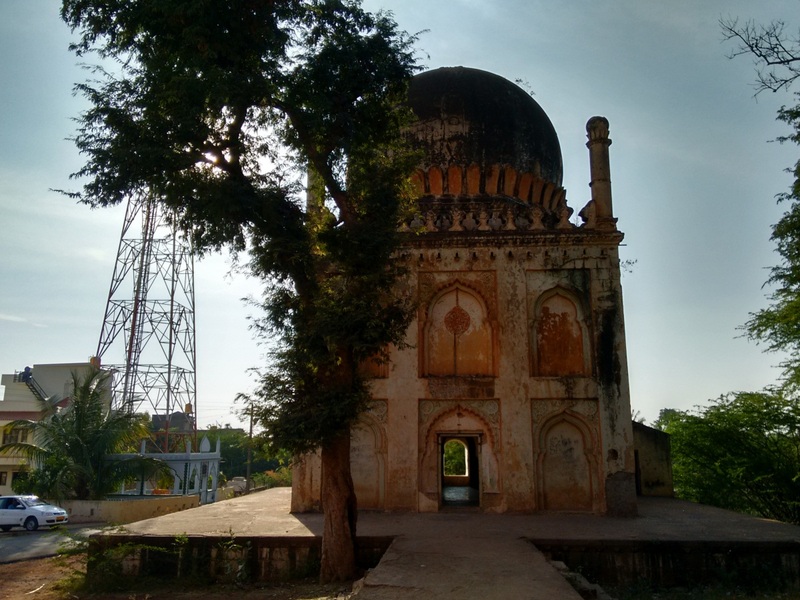 The larger tomb here was built by Ain-ul-Mulk in 1509, but was not buried here. The small gummat was constructed by his brother Fateh-ul-Mulk in 1555. The fort was constructed by Ain-ul-Mulk in 1505. The other two dargahs [empty] are also used for Government purposes. Of these, Chini Gumat with glazed tiles was built by Rustam Zaman. At Gajabarwadi is the dargah of Gajbarsaheb, built in about 1498 by Ketagauda, Desai of Nanadi. 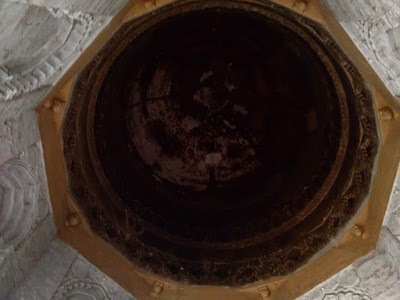 The place has Mathas like Shivamoggi Matha, Kundargi Matha, Gadduge Matha, Niluvangi Matha, Bagewadi Matha, Galatag matha, Budihal Matha, Kallayayyana Matha, Gundagi Matha, Bhandari Matha, Haveri Matha and Mallesha Matha. The gramadevata is maruti whose image is one meter tall. Ishwara temple of Gajabarwadi is a recent reconstruction. There is an old temple of Someshwara and nearby is a small shrine of Kalabhairava in dilapidated condition. There is a Vithala Mandir of Vijayanagara times and a herostone near which there are some Later Chalukyan antiquities. There is another Maruti temple [near Post Office]. There are three Jaina Bastis two in the town, and one outside which is built in 17th century. The Adinatha Basti and Parshwanath Basti are side by side. Images of both the Bastis have Makaratorana in their Prabhavalis indicating their antiquity. A stone lying inside the fort [the old Munsiff office] mentions Trikirti Yapaneeya Sangha and is in characters of 12th century. An unpublished Nagari inscription is found near the Vithala Mandira in about 15th to 16th century characters. Wish I'd researched before the trip I could have covered all the monuments with my Canon DSLRs. Hopefully some day I'll make another trip to the bygone flower street Huvinakeri. BTW, Ain-Ul-Mulk's tomb is near Bijapur at this spot. Sid, Your interest and knowledge about these structures is really amazing. Nice to hear about the renovation, Md. Rizwan.